Fiction and Non-fiction Writers: Win a total sum of £45,000 (in Grants) – Morland Writing Scholarship | Welcome to Dare Lasisi's blog! 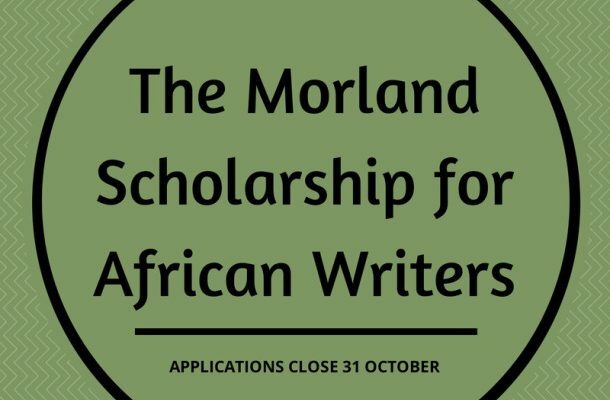 African fiction and non-fiction writers can win up to £45,000 (in Grants) from the Morland Writing Scholarshiporganised by The Miles Morland Foundation. Applications will be received between 30th June 2016 and Oct 31st 2016. Applications submitted outside that period will not be looked at. It can be difficult for writers, before they become established, to write while simultaneously earning a living. To help meet this need the MMF awards annually a small number of Morland Writing Scholarships, with the aim being to allow each Scholar the time to produce the first draft of a completed book. The Scholarships are open to anyone writing in the English language who was born in Africa or both of whose parents were born in Africa. Scholars writing fiction will receive a grant of £18,000, paid monthly over the course of twelve months. At the discretion of the Foundation, Scholars writing non-fiction may receive a grant of up to £27,000, paid over a period of up to eighteen months. At the end of each month scholars must send the Foundation 10,000 new words that they will have written over the course of the month. Scholars are also asked to donate to the MMF 20% of whatever they subsequently receive from what they write during the period of their Scholarship. This includes revenues as a result of film rights, serialisations or other ancillary revenues arising from the book written during the Scholarship period. These funds will be used to support other promising writers. The 20% return obligation should be considered a debt of honour rather than a legally binding obligation. To qualify for the Scholarship a candidate must submit an excerpt from a piece of work of between 2,000 – 5,000 words written in English that has been published and offered for sale,. This will be evaluated by a panel of readers and judges set up by the MMF. The work submitted will be judged purely on literary merit. It is not the purpose of the Scholarships to support academic or scientific research, or works of special interest such as religious or political writings. Submissions or proposals of this nature do not qualify. The only condition imposed on the Scholars during the year of their Scholarship is that they must write. They will be asked to submit by e-mail at least 10,000 new words every month until they have finished their book or their Scholarship term has ended. If the first draft of the book is completed before the year is up, payments will continue while the Scholar edits and refines their work. The candidates should submit a description of between 400 – 1,000 words of the work they intend to write. The proposal must be for a full length book of no fewer than 80,000 words. The MMF does not accept proposals for collaborative writing or short story collections. The proposal should be for a completely new work, not a work in progress, and must be in English. Please also tell us in 200 – 300 words something about yourself and your background. People who reach the short-list will be asked for further information about themselves and how they propose to write their book. The Foundation welcomes both fiction and non-fiction proposals. We are aware that non-fiction Scholars may need extra time for research, so the Foundation may exercise its discretion to offer non-fiction writers a longer Scholarship period of up to 18 months. The Scholars may elect to start at any time between January and June in the year following the Scholarship Award. Their payments and the 10,000 word monthly submission requirement will start at the same time. The Scholarships are meant for full length works of adult fiction or non-fiction. Poetry, plays, film scripts, children’s books, and short story collections do not qualify.